The new suits were designed with pro surfer and Lululemon ambassador Malia Manuel, so you can bet they were created to withstand whatever the ocean throws at you. The collection just launched today, but I was lucky enough to test it out last week, when Lululemon invited me for a surf session in Malibu (with Manuel on hand for much-needed pointers, of course). I hit the surf wearing the new bikini, and I can definitively confirm that it didn't budge one bit in the waves. There are no ties or closures to come undone, and the cross-back detail ensures that the straps won't be falling off your shoulders. Bonus: I thought the bikini top had an amazing push-up effect on my small chest—a miracle if I do say so myself. As for the bottoms, they feel snug and secure without feeling tight and won't put you at risk for an embarrassing moment after a big wave. 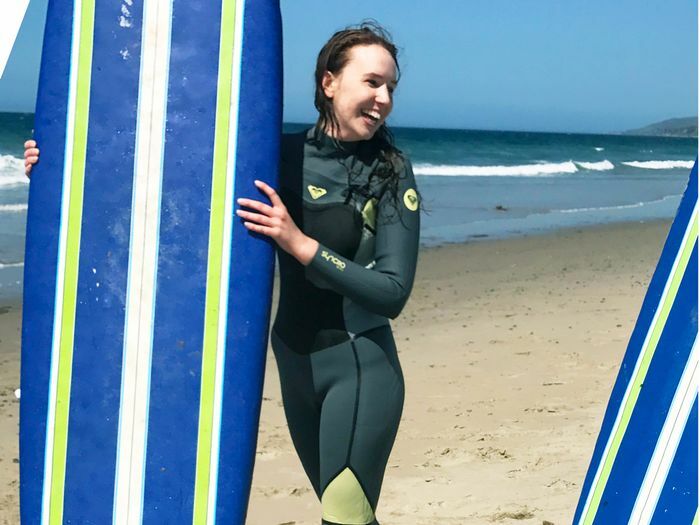 Plus, I later put on a wetsuit to guard against the chilly water, and I thought the bikini was the perfect thin, unnoticeable layer to wear underneath—it definitely lives up to the "second skin" description. Don't believe me? Scroll down to shop the bikini as well as the cute one-pieces from the collection. Here's me in the center with pro surfer and Lululemon ambassador Malia Manuel on the right and Bustle editor Sara Tan on the left.